Areas eligible to receive Cherish funding include, but are not limited to, projects within Wisconsin’s State Wildlife Areas, State Fishing Areas, State Parks, and State Natural Areas. Projects must address habitat management that benefit a wide variety of species—game, nongame, aquatic and terrestrial. 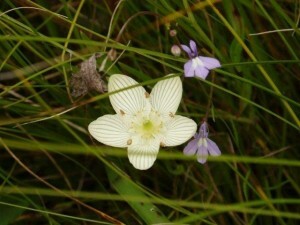 Marsh grass of parnassus. Photo by WDNR. Enhancing habitat for game species as well as threatened or endangered species, improving fishing opportunities, and increasing accessibility along the Ice Age Trail. Improving habitat for Species of Greatest Conservation Need such as lark sparrow, northern long-eared batts, as well as highly prized game species including white-tailed deer, bear, turkeys, and waterfowl. The presentation below outlines the 2017 grant projects in more detail. You can also CLICK HERE to view the presentation in full-screen mode.